Web Solutions' Webhotel hosting packages have been designed to meet all your hosting needs. Professionalism and safety is what makes us stand out among other European hosting service providers. Quicknet, Business and Corporate hosting packages with unlimited data transfer - trustworthy doorway for your company to the World Wide Web. Choose the hosting package that best corresponds to your needs! Hosting type Please select the hosting package that best corresponds to your needs. Domains Please enter domain names you wish to register. One domain for each line. You can check availability of chosen names after clicking button below (new window). Server disk space that you can freely allocate for e-mail accounts and server ftp/www. For each Web server there can be assigned multiple Internet domains. Domains can point to any server directory or can be parked on the home directory of the server. All packages have unlimited bandwidth. That means no excess charges, no matter how many visitors your site gets. On one hosting account you can have as many e-mail accounts as designated in your hosting package and you can send maximum 300 mails per number of users per day. Regular file and database backup guarantee protection against any loss of data. TCP/IP protocols used for mail delivery. Each protocol is just a specific set of communication rules between computers. Our hosting services guarantee the safety of your network and keep your e-mail inbox spam-free. DNS management is mainly used to redirect a domain. This means automatically direct all visitors from one server to another. Comprehensive statistics allow you to measure and analyze the popularity of your websites. Database management system used for scripting and web pages management. A website hosting management tool. Self-service backup management. Backups will allow you to archive a copy of the entire account or a part of it, such as files, databases, e-mail accounts, e-mail forwarding, e-mail filters, etc. The most popular language for creating dynamic web pages/websites. PHP is widely used by developers creating applications such as forums, content management systems, web shops. This is a popular programming language used primarily for analysing text files and creating reports; it can enhance the functionality of your web pages. With CGI support you can use ready CGI scripts in your website. You can also write and use your own CGI scripts. Sitebuilder is an easy to use application designed to create and manage websites. This feature can be purchased as an add-on for packages that does not contain it. MS SQL is a relational web hosting database that is used to store web site information like blog posts or user information. MS SQL is the most popular type of database on Windows servers. Microsoft Access® is equipped with many powerful features to help you create sophisticated solutions, extend data to your site, and build database solutions faster. The tools found in Access are sophisticated enough for seasoned professionals, yet easy enough for beginners to learn. ASP MVC is an open source web application framework that implements the model–view–controller (MVC) pattern. Secure connections to your web site using a certificate. Provides secure transfer of personal data on the Internet. Hosting with Web Solutions is the number one choice for people who have their website already set up or wish to program it from scratch in the PHP or ASP.NET environment. 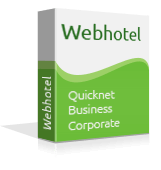 Our hosting packages, Webhotel Quicknet, Business and Corporate, distinguish themselves by the lack of data transfer limits and high safety standards. In addition to the unlimited data transfer, we offer daily backups of your data, secure SSL certificates and anti-virus & anti-spam protection. We guarantee professional technical support to assist you in your daily usage of our servers. Check out our offer! Webhotel comes with your choice of either Windows or Linux platform. When ordering a hosting package with Web Solutions, in the order form, you can select the system it should run on (Linux or Windows). Before choosing a platform for web hosting service, think about what kind of tools and development environments you will be using most often - if you are going to use PHP, MySQL, Perl, and external applications, Linux is the best option for you. If you want to use the applications licensed by Microsoft, select Windows hosting. Browse through all the features of hosting packages on offer at Web Solutions and you will certainly find a wide range of solutions and huge possibilities to manage any website according to your preferences. We guarantee unlimited data transfer. There are no set limits on the data transfer (bandwidth) that we provide in our Webhotel hosting plans. We perform daily backups. Should anything happen, we will be able to recover your website. We guarantee our customers at least 99% network availability on average. Stay online with us without any interruptions. We provide virus and spam protection. Our hosting ensures to keep your e-mail inbox clean and your network safe. Contacting us is possible via the telephone, the online form or the chat window at the bottom of the page. Our power consumption in our hosting center has been reduced by appr 50% within the last 2 years as we have been migrated to ECO Virtual platforms and closed down old servers. As part of your hosting account you get your own server disk space that you can freely utilise as a web page, mailboxes (e-mail), database (MySQL) and files that you can upload and share using FTP or WebDisk. Each hosting account has an unlimited traffic package (data transfer), which is used for the traffic generated by your website, downloading and sending e-mails as well as downloading and uploading files via FTP or WebDisk. For each hosting account there can be assigned a certain number of domains (depending on the chosen hosting package). Each additional domain (Website) can be assigned to any subdirectory on your server where the Website's files will be placed. Within each hosting account you may run a certain number of MySQL databases. This allows you to create a dynamic Website or a database system. MySQL databases are used, among others, by popular CMS systems such as WordPress, Joomla, etc. To manage the MySQL database, we provide the phpMyAdmin panel. FTP Accounts allow you to instantly place your pages on our server and update them. One main FTP account is activated with each hosting account. You can also create additional FTP accounts with access to the whole server or limited only to specified directories on the server. Within each hosting account, you can create additional FTP accounts with access to only one of the selected directories. This way, you can give access to your server to people who cooperate in creating and updating the Website and, at the same time, should not have access to other files stored in other directories. Each hosting account offers support for mod-rewrite extensions that you can use to create SEO friendly links within your website. Available only with the Linux platform. CRON Scheduler allows you to periodically run your own scripts at the set time. Available only with the Linux platform. Accessing any directory on the server over the Internet can be protected by an individual username and password. You can set up your own login and password in the Administration Panel of the server. This way you can protect access to the sites that are still in development and should not be visible to all users.